At our home, in restaurants, and "out and about," we frequently take time for fun with our students, former students and friends. 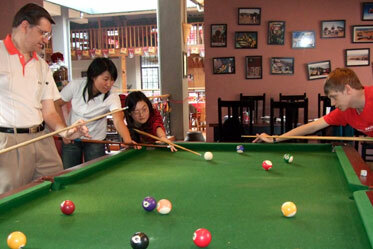 (Left) We invite students and friends to join us (at home) for a movie almost once a month. This group is waiting to see to see a movie (Kunming, Oct 2007). (Right) After our summer in Alaska and at the Olympics (2008), a few former students students joined us for pizza at Kunming's oldest pizzeria (which soon thereafter went out of business).  To get invited to these special events, all they have to do is send us an email; then when we have something special planned, we send email with the details to everyone on the list. 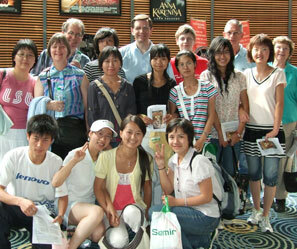 Here we are at a Kunming theater to see Prince Caspian with students and friends (2008). Afterward, we talked about the film at Kunming's only donut shop (just down the street from this theater). The Movie Study Guide is posted on this website, with guides to many other films. 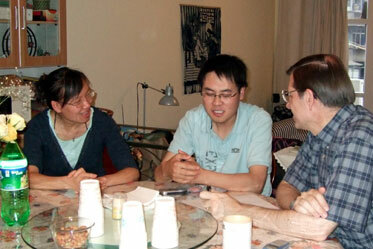 When we have time, we enjoy participating in English Corners, where local people come to practice their English. 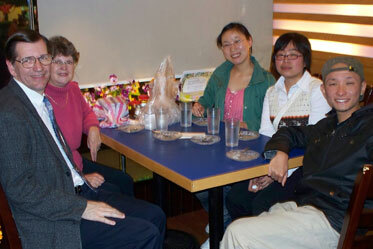 This 2007 photo shows Michael teaching guests about Easter at an English Corner in a coffee bar near our Kunming home. 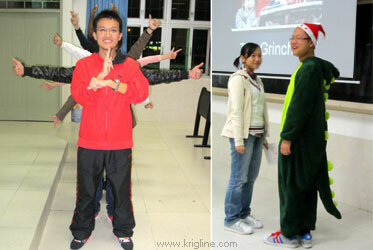 In Xiamen, Michael often helps at an English Corner on Saturdays in Zeng Cuo An (near our apartment). Michael met Tomy in a photocopy shop. 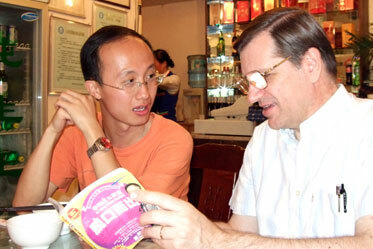 Since we both taught English, it was fun to talk about our interests over a meal together -- when our hectic schedules allowed (KM 2008). 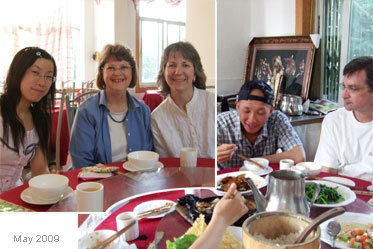 After one of our friends was baptized at St. John's downtown (Kunming 2009), we continued the celebration with ice cream. Since 50 people were baptized that night, it was a very moving and memorable evening. We got very close to Nico and Lucy during Michael's first year at KMU, and we are always glad to see them again (like here in our dining room--2008). 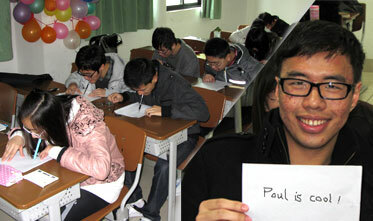 Many former students stay in touch, and occasionally we get to see them in other parts of China. Now we are even getting the joy of receiving photos of their children! 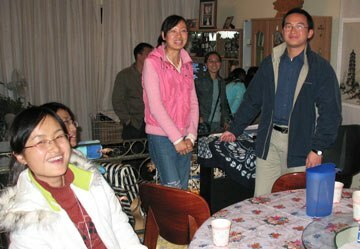 When Michael's sister and brother-in-law visited (May 2009), they got to meet and eat with some of the students, too. Class is often fun as well! 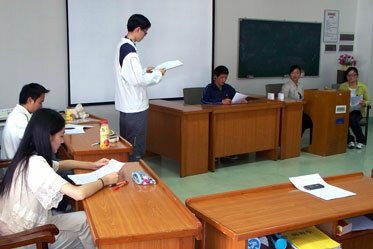 Here, students are performing an Easter "courtroom play" where the gardener is on trial for grave-robbing. Role plays and Readers' Theater are common parts of the curriculum. Another fun thing we do in class is perform Readers' Theater and role plays. The students can be very creative! Here they perform scenes from Lighting Larry and the Grinch. My classes also feature lots of chances for partners to talk about interesting subjects, such as "The Science of Happiness." 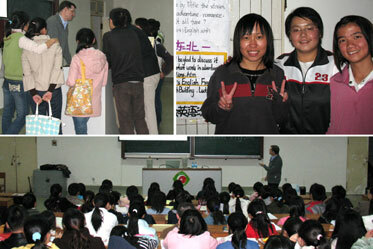 That lecture series also lets students try their hand--or mouth, actually!--at "smile writing." (these were from the 2012-13 school year). For many years, we've enjoyed sharing meals with 4-6 students at a time, giving them a casual chance to use English outside the classroom. 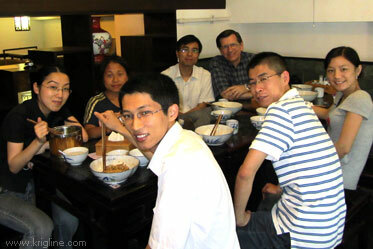 (Left) Some of my "weekend students" (at the invitation of a local fellowship, 2012) join us at a "noodle shop." (Fall 2012) Vivian and I reserved this corner of the university canteen every Tuesday. In spite of the noisy crowd, 15-20 students chose to come speak English casually with us weekly. In 2012, Vivian took time out of her busy schedule to teach Michael's students how to bake, following an English recipe. These classes were so popular that we had to turn people away (our kitchen is very small!). That's why it is important to respond quickly to email invitations! I get lots of help from class monitors! In early 2013, we treated these monitors and top students to a nice dinner near campus. Once or twice a year I bring a guitar to class. 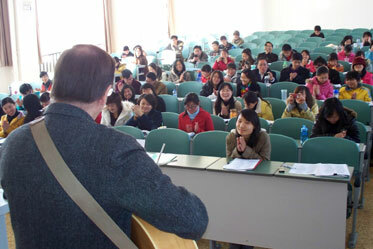 In these 2009 photos, after previewing for the final exam and once all the "work" is done, I share some of my songs with the Kunming Medical University students (many are looking down at a lyric sheet, which helps them understand the words). 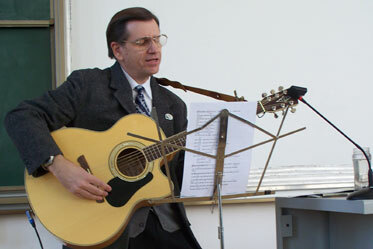 These "concerts" are always fun for everyone--as long as they remember that I'm an English teacher, not a singer!